Lobia Masala Curry Recipe - A traditional punjabi recipe of lobia masala are cooked in onion-tomato based gravy with Indian spices. It is a flavorful and creamy staple food every Punjabi grew up. 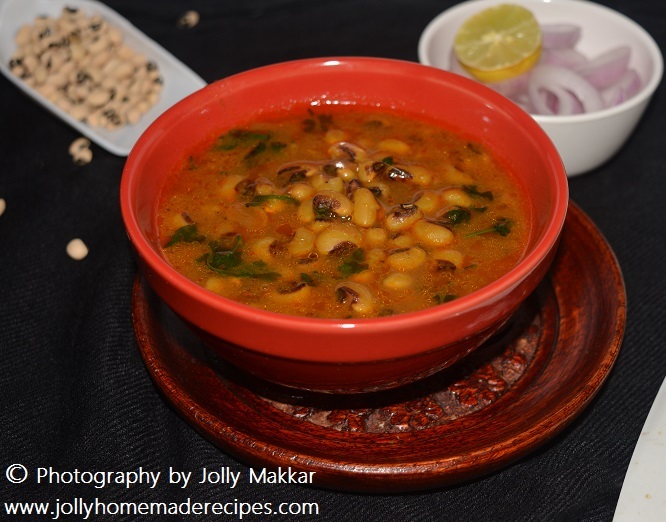 For a long time I wanted to post this punjabi recipe of lobia masala or lobia curry recipe, but was not able too. This is personally mine and my family favorite dish, so this is prepared in our lunch menu or sometimes dinner menu with rice or roti atleast weekly or bi-weekly. 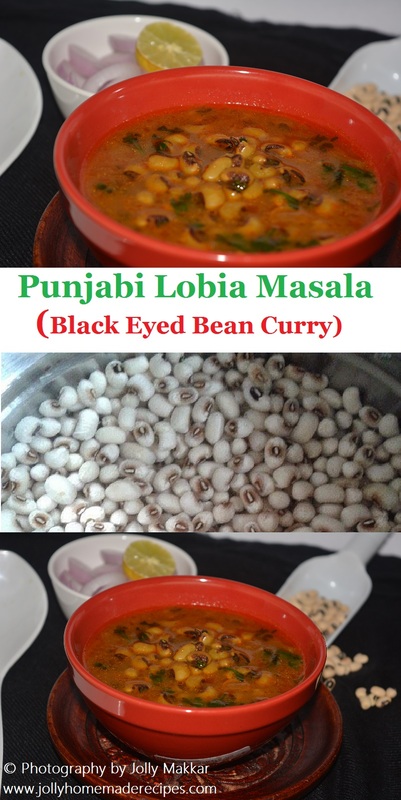 This black-eyed peas known as lobia in Hindi language or we punjabi called lobia or rawayi are small white seeds with a dark spot resembling to eye. Hence the name black-eyed. 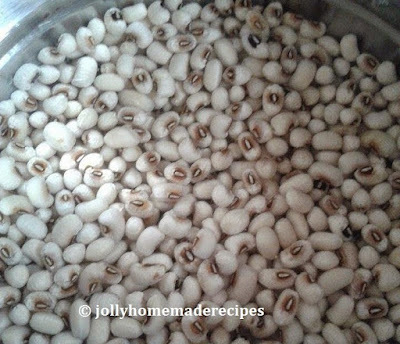 It is also known as chawli. 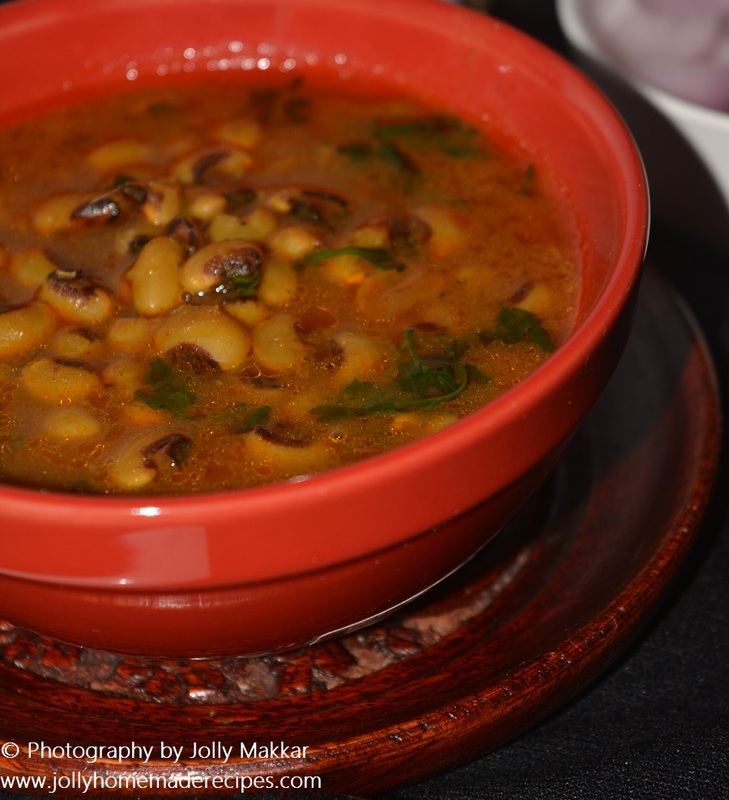 Lobia curry is best served with jeera rice or simple roti or with any Indian bread. I have learn't this curry recipe from my mother. Her recipes are always easy and simply made with basic ingredients which is easily available in our Indian kitchen. 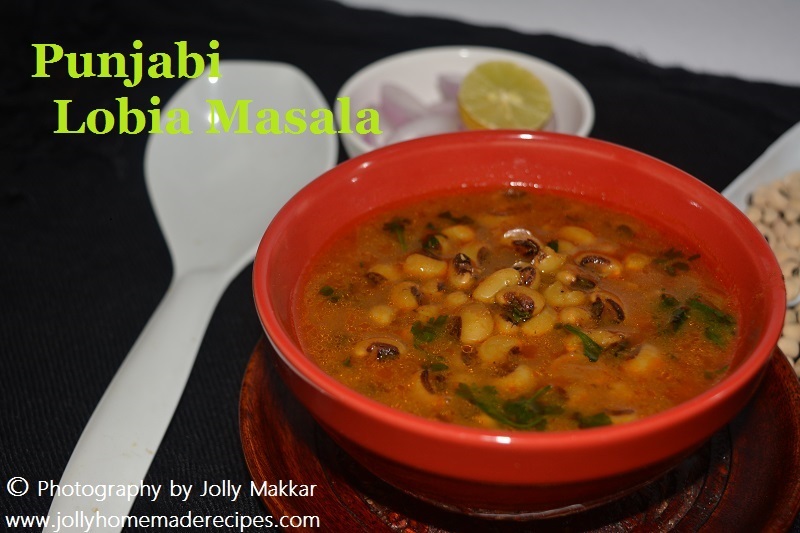 The lobia masala recipe that I am sharing today has been prepared in traditional punjabi way. Let's start the procedure of how to make this simple and yummy dish of lobia masala with step-by-step process. 1. First clean and wash the lobia 2-3 times with water. Then soaked the black eyed bean for 1/2 an hour and drain it. Keep it aside. 2. 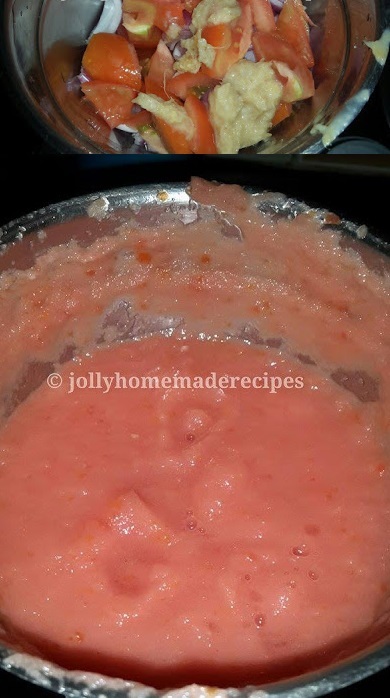 Make masala for curry - Grind the chopped onions, tomatoes, ginger, garlic paste in a mixer grinder. Add little bit water in between to make masala. 3. Heat a oil in a cooker, add above onion-tomato curry masala. Saute for few minutes. Add all spices coriander powder, red chilli powder, turmeric powder and salt, saute in a low flame till the masala is cooked. When masala is leaving oil in around, it means your masala is cooked. 4. Toss drained black eyed beans in masala and add 5 cups(approx.) of water in it and mix well. Pressure cook the lobia with until done. Give 1 whistle in a high flame, then reduce the flame in low mode and cook for 15 min. 5. Now open the pressure cooker, adjust salt if it is required. Add Garam masala powder and chopped coriander leaves and if the curry is not thick, reduce the curry to giving 1-2 boils in a high flame. 6. Punjabi Lobia Masala is ready to eat. Serve hot with rice, chapatti, lachha paratha and butter naan. 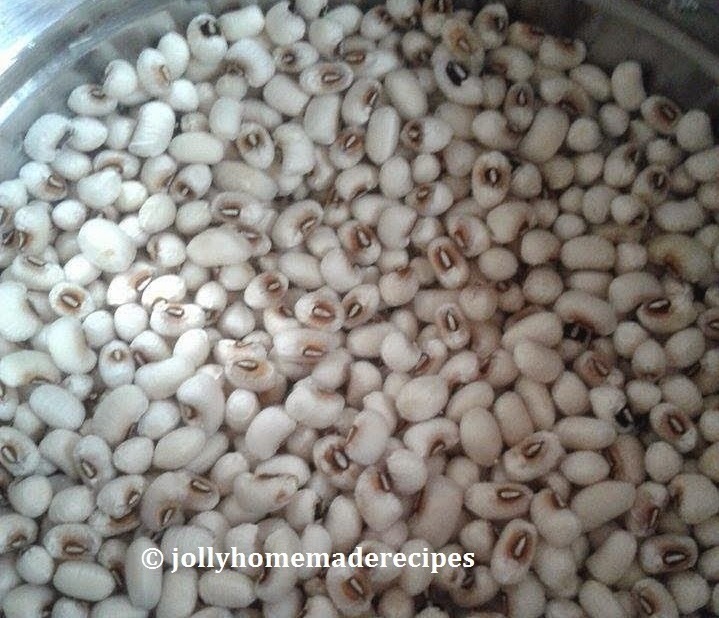 I have to try out this one for sure Jolly.. We get to see this beans here a lot in super markets.. Let me see.. It looks delicious..
love this punjabi lobia masala..perfect!! wow..this is my all time favorite. Looks so flavorful and delicious! In Sindhi cuisine also we make the same curry more or less the same way. I had this in restaurant. My kids loved this:) Looks so delicious and flavorful! 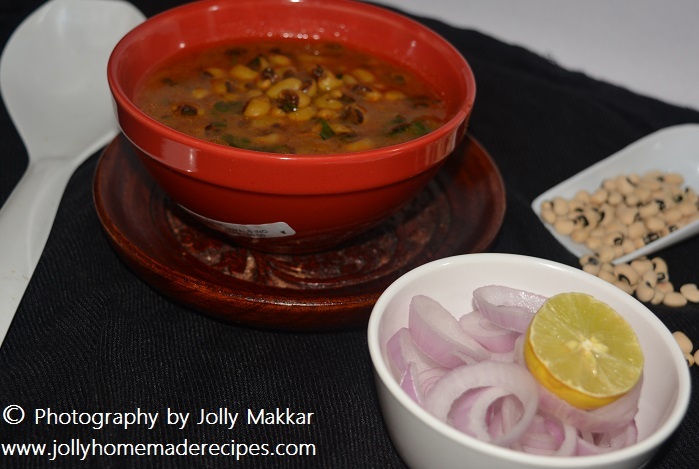 Excellent side dish to relish with some Phulkas, lipsmacking protein rich nutritious masala Jolly, lovely dish there. My last minute dish is lobia. 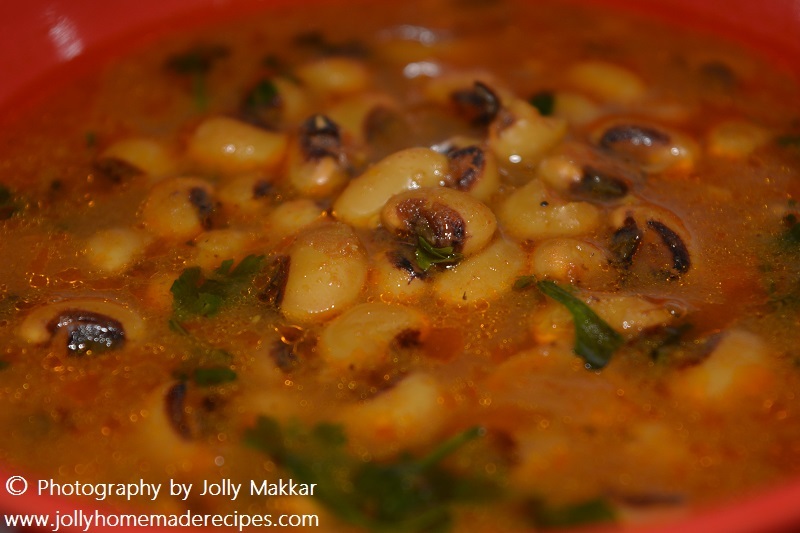 I too love this way but I always make with black and kabuli chana. This is the easiest but tasty gravy for any legumes. Nice presentation . I don't like lobia much but your dish looks so flavourful and delicious. Tempted me to try it. Lovely share. A simple, protein rich dish that makes for a complete meal with rice or roti. Lobia, my all-time favorite! Lobia masala curry looks delicious and would love to enjoy some with some hot Basmati rice :) Superb share! 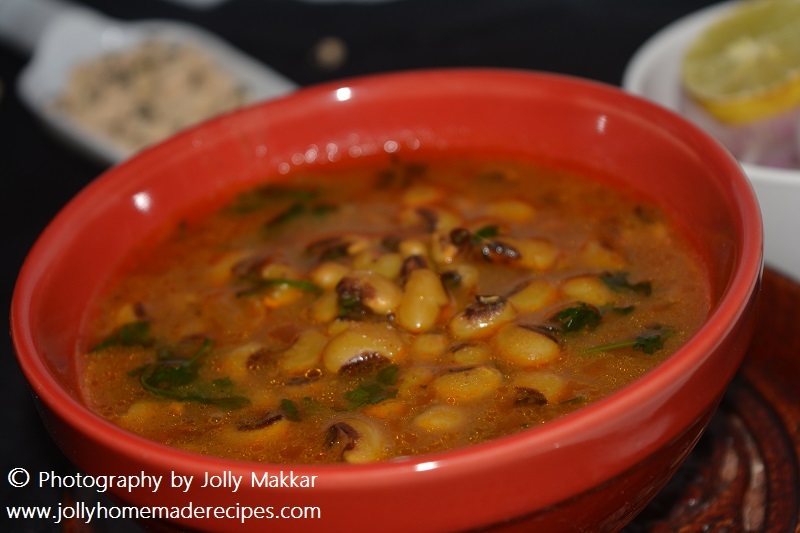 I make this once a week or so as any pulses including Lobia is good for health due to high protein content. I serve this usually with Jeera Rice and it forms a wholesome meal. Loved the recipe, this is one pot meal with great flavours and health too. Your lobia curry is looking so good that I'm tempted to make it now. Lobhia curry is one of the frequently made curries in my house and I make it in a very similar way! love it with phulka and rice. During the season, I keep buying lobia. I prepare similar kind, yours looks delish. Lobia goes well in my family, of course Punjabi style :) Healthy and delicious dish one can have. 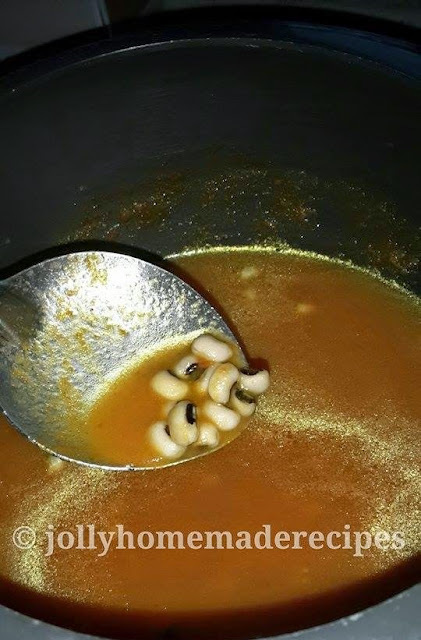 How can Punjabis forget this humble lobia, I make it once in fortnight. Looks exactly like mines. Good one.